Fly the colors high! 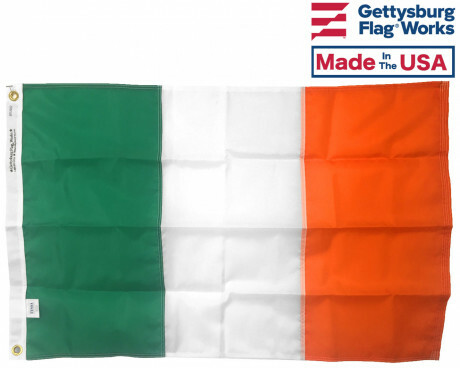 Gettysburg Flag Works has a wide range of Irish flags to suit any need you might have. An Ireland flag is perfect for display on St. Patrick's Day, advertising an Irish Pub, or just displaying pride in your heritage! The Republic of Ireland flag has been in use since 1916. Its 3 vertical stripes are meant to echo the famous French tri-color. The green stripe represents the island's Catholic population, the orange stripe represents the Protestants, and the white stripe in the middle is meant to symbolize peace between those 2 populations. The Republic of Ireland makes up most of the area on the island of Ireland in Northwest Europe. An Ireland flag from Gettysburg Flag Works is going to adhere to the high standard of quality we have for all our products. Our standard outdoor Ireland flag will come in our colorful nylon, in sizes that range from the tastefully small to the huge. If you are marching in an Irish parade and need a large quantity of hand flags to wave, you should take a look at our Ireland stick flags. 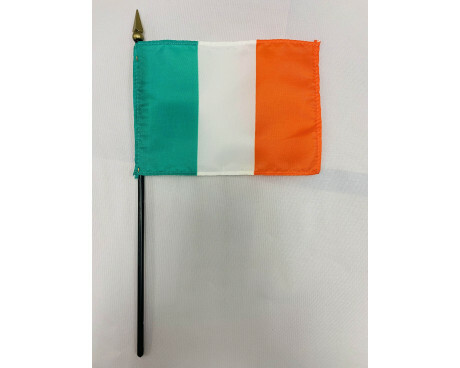 Mounted on a staff for easy waving, these miniature flags have a miniature price point to match. For those who don't have much room to display their Irish pride, fear not! Our small Irish Shamrock garden flag is compact, but no less durable than our larger outdoor flags. Gettysburg Flag Works is also proud to offers outdoor flags as well as stick flags for every Irish County. Get your Ireland flag today! 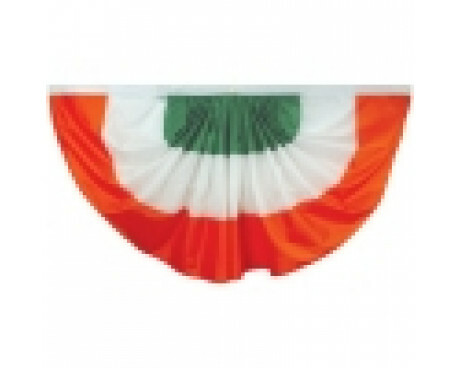 Irish Parade Sashes - Beautifully embroidered, these sashes are perfect for showing your Irish pride in a parade. Customized options are also available. Custom Marching Banners - Marching in a St. Patrick's Day parade? Show your Irish pride with a custom Irish parade banner! St. Patrick's Day Flags and Banners - Festive St. Patrick's Day flags, decorations and more, perfect for showing your Irish spirit. Customized Flags - Don't want to settle for just any old Ireland flag? Want to set yourself apart and be the talk of the town? Work with Gettysburg Flag Works to develop a custom Ireland flag that we will print just for you. Additionally, many customers who bought an Ireland Flag were also interested in house mounted flagpoles. 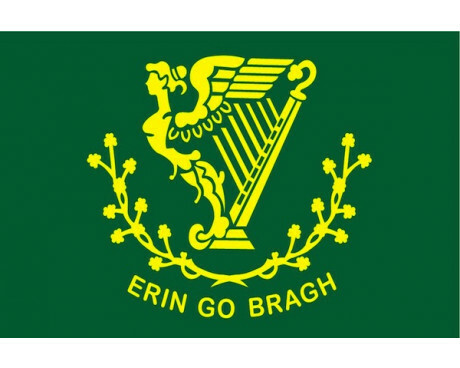 Place Your Order for Irish Flags, Banners & More Today! Give us a call at 1-888-697-3524 or contact us online with any questions or inquiries you may have! We look forward to providing you with high quality Irish flag products. Place your order today!